Who and what is a Muslim? 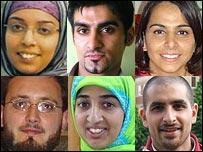 Six very different Birmingham Muslims share their faith and tell us of their lives. Muslims from Birmingham respond to 7/7. Feature by New Media Producer Sarah Loat. A Grand-ole Well Done to the Beebs! After the weeks of waiting I finally managed to see the consultant; though tell a lie it wasn’t the consultant but his psychic that I actually saw. He wiggled my fingers about and flopped my hands about to check where the pain was. I must admit he was one of the most down-to-earth and human consultants my being had ever been placed in front of. I think he will do well. I hope he does well. Being spoken to as if you are not an ant – wow! No medical jargon, plain-simple English what a girl like me likes – no cryptic crap which makes one question what possessed them to go into the clinic in the first place! I have in the past met consultants who really made me feel like a scum of the earth – like it’s my fault I’m ill yeah?! So the conclusion was to start the process of elimination… beginning with Rheumatoid Arthritis for which I was introduced with the Count. It took two vampires to find my tiny veins, which I feel were still asleep. Finally the Count herself came with the syringe as we all waited for the morning birds to sing the vessels into wakefulness. And then it was drawn.. bottles and bottles of burgundy fluid from my arm. Now I await an appointment with the Neurophysiologists who will kindly electrode me for a nerve test. Makes me feel a little like the fella from Quantum Leap, in fact sad to say that’s exactly what passed before my eyes when I was told about it! This is to ensure I don’t have trapped nerves and to eliminate the possibility of Carpal Tunnel Syndrome (which is so common because I keep bumping into people with it). So more prodding and probing in an attempt to find a diagnosis. I feel an extension on my sicknote is coming this way as I start my 21st week off-sick tomorrow! Until an overall diagnosis is not established I remain in limboland! These last few months really have turned my world round. I have been made to analyse the many spheres of my life as I try to discover what my relationship is with myself, my family, friends, jobs, art project, the community and most important of all My Creator. Where am I heading? What is life? What is the meaning of these events? Why is this happening? Have I done something wrong? Will there be an end? Will I cope through this? What is important to me? Who are my real well-wishers? What are my life priorities? Am I growing weak? Do I show signs of one without faith? Why do I feel uncertain about my being? Where are my strengths? What is happening to my world? Was this ever my world if now I feel it isn’t? These months have shown be Reality in a manner I had never envisaged and given me insights which force me not to bow to misery. Prayers for all well-wishers & may the angels be with you all. Ameen.